What inspired you to get involved in the screen industry and specifically sound engineering? I grew up writing short stories and acting in small plays. As I went through high school I looked for ways to turn my passions into a career. I first applied for the New Zealand Broadcasting school wanting to be an offline editor, which I figured was another way of writing or performing stories. 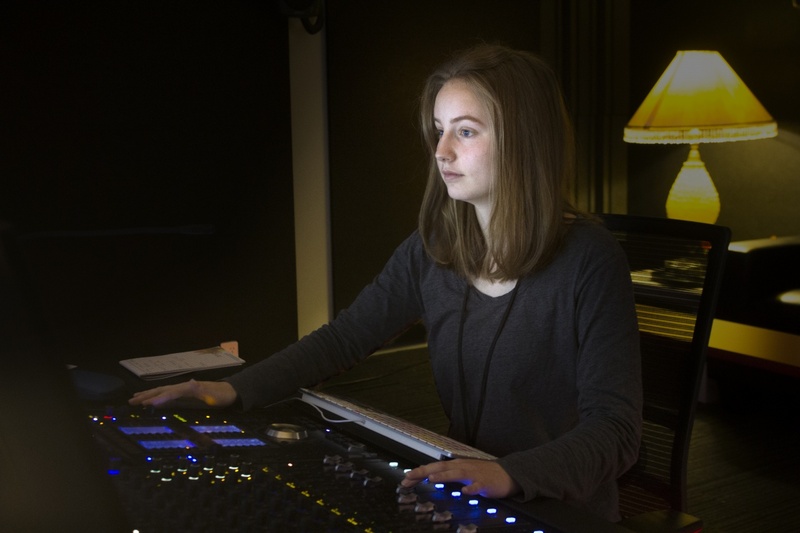 Once I was studying at the school I had the opportunity to explore and learn about many different roles that I hadn’t previously been exposed to – one of them being audio mixing. I found I loved this aspect of post production the most for a few reasons. I was really drawn to it because I got a lot of satisfaction from making my mixes the correct level; I loved the way music brought a project to life; and I loved that I could look at an edited piece of work and begin my creative process from there, and aid with the final lift of the project in online. Oddly Even was definitely a highlight for me. It’s a web series for TVNZ On Demand and it was the first project that I got to take charge of. It was a quick turn around, so it was a big push each day for just under two weeks, doing the full mix in a day for each episode and then a review in the evening. I also really enjoyed being a part of She Shears and Bludgeon. They were both films for NZIFF and I was lucky enough to do some sound design on those two. She Shears was great because it had a lovely team behind it and Jack is such a pleasure to work with. Bludgeon was also great because it had such a good story and we really got to play with the sound design and effects. I arrive at work, make myself a tea and then open up my emails and check the calendar in case anything new or urgent has come through overnight. I’ll then check in with the rest of the audio department for a short meeting to ensure we’re all on the same page and work efficiently. I’ll write myself a ‘to do’ list for that day and get to it! My list usually includes unpacking and prepping sessions for voice overs, running voice over sessions, dialogue editing, sound design and sound effects editing, final mix and balancing, as well as mix reviews. The audio department is quite collaborative, so I often find myself doing sound design or effects editing whilst [colleagues] Derek or Shiv work on the dialogue. Usually if I’m doing sound design I’ll get to do some Foley record in the suites here. Where do you see yourself in 5-8 years and how will DOP have helped you get to that position? I feel very fortunate to have a position at DOP, especially so early on in my career. I believe it’s a very unique facility in terms of the scale of projects it brings in and the number of full time staff/ contractors working there. The audio team consists of three full time engineers, and considering I am one of those three, I feel it’s really important I continuously work on bettering my skills. I’m really fortunate that Derek, our Head of Sound, is so willing to not only put in the time to train and go through things with me, but also to allow me to prove myself by taking on important tasks. As for where I see myself in five to eight years, I always find that such a hard question to answer. Not because I’m not striving for goals, but because I feel the industry is changing dramatically and I’m unsure exactly what it will look like that far into the future. In saying that, I’m really interested in sound design and Foley. I have a lot of fun designing landscapes and environments for various productions. I would love to work on a sound design team for animations one day. I feel like there’s a lot of opportunity for creativity and control in that space, and I would love to be a part of a team that’s built an immersive sonic environment up from silence. What would be your best piece of advice for other young people starting their first role out of training? One, people won’t remember how quickly you complete a task, they will the remember the quality of it. This is so important to remember because there is a lot of pressure to go quickly – you’re surrounded by people who have been in the industry for five or more years and have mastered their craft. Of course there are always deadlines, but that’s for your seniors to manage. Communicating where you are at and how long you think you have to go is what will help your seniors to schedule and know how much work you can complete to a high standard. Two, your attitude is key. You need to be genuinely excited and passionate about the field you’re pursuing, especially if you want people to invest in training you. You may not have the skillset, but if you can show a positive attitude towards any task, go looking for tasks, and show that you are putting in the hours to increase your skillset, then the right people will trust in you. Training someone is a huge risk for employers, money and time wise, so you need to prove to them that you are worth that risk and investment. What is the vibe in the screen industry across Auckland now, with big projects in town and The Meg a hit in the international box office? I’d say there’s an exciting vibe. There’s no real panic to leave New Zealand to explore bigger opportunities, because productions such as The Meg are right here in Auckland, and so are some awesome directors and producers just doing their thing. I don’t think we have to necessarily be looking at the big productions to get excited. There’s plenty of action happening at every level which is great, especially for people wanting to explore different areas, gain experience and get their foot in the door. It’s a great time to be meeting people and creating relationships. So many people are doing their own thing and it feels like nobody is afraid to just go out there and get it done. I really appreciate working with directors and producers who are real about where they’re going and what they’re wanting to achieve.